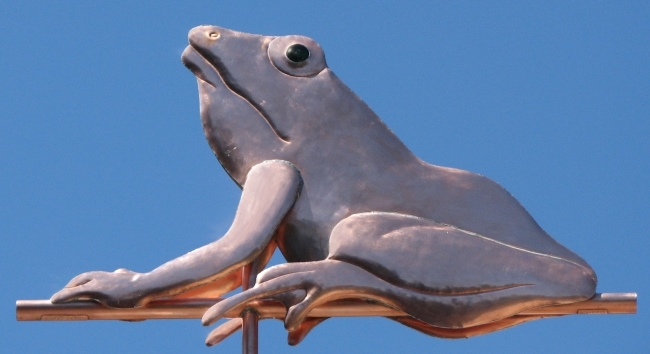 The Sitting Frog Weather Vane, Amphibian anura, featured in this image consists of a hand fabricated copper frog. A nice feature of this design is copper’s eventual patina to a beautiful shade of greenish blue. Over time, its color should more and more closely resemble a real frog! The eyes are made from handcrafted translucent glass. 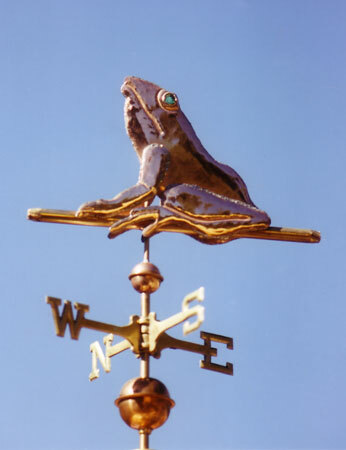 People who order this weather vane choose the eye color they want. Popular choices of eye color for this vane are green, emerald, red or topaz. Due to their permeable skin, frogs are often semi-aquatic or inhabit humid areas, but move easily on land. They typically lay their eggs in puddles, ponds or lakes, and their larvae, called tadpoles, have gills and develop in water. The distribution of frogs range from the tropics to subarctic regions, but most species are found in tropical rainforests. Consisting of more than 5,000 species described, they are among the most diverse groups of vertebrates. 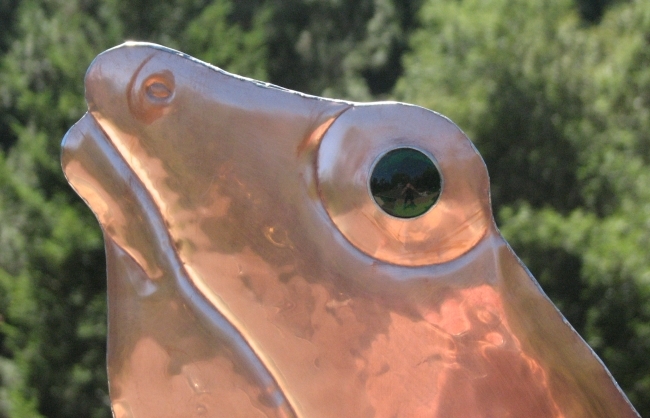 Frogs feature prominently in folklore and fairy tales in many cultures. Popular culture tends to portray frogs and toads as benign but ugly and often clumsy, but frequently with hidden talents. The children’s story of the ‘Frog Prince’ is a case in point. To the Egyptians, the frog was a symbol of life and fertility, since millions of them were born after the annual inundation of the Nile, which brought fertility to the otherwise barren lands. In Egyptian mythology, there is a frog-goddess, who represented fertility, named Heget. 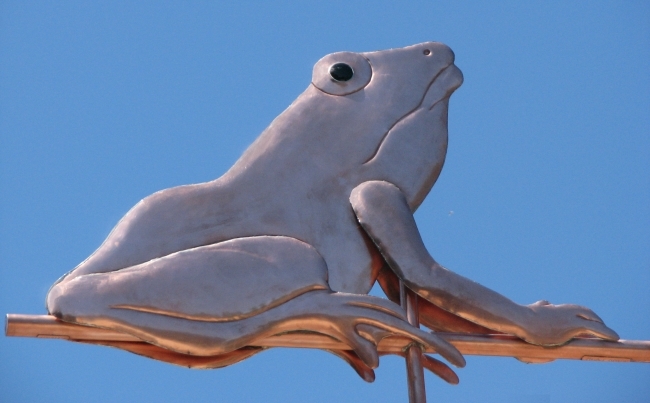 For the Romans, the frog was a mascot believed to bring good luck to one’s home. 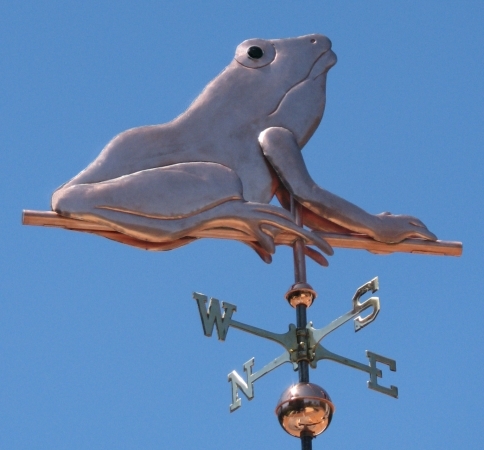 This same tradition exists in Indonesia, where one of our Sitting Frog Weathervanes makes it’s home. The Aborigines of Australia believe that frogs brought the thunder and rain. The movie, ‘The Last Wave’ by Peter Weir makes eerie use of this belief.